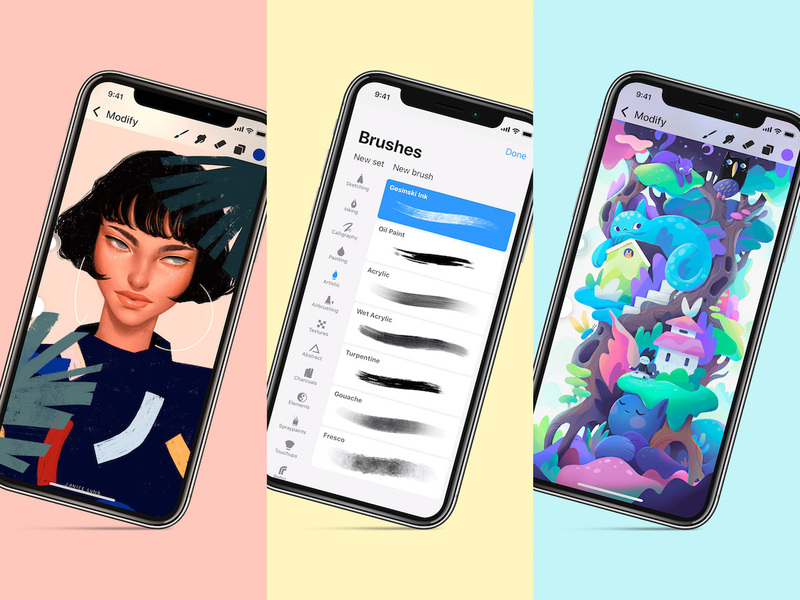 Illustration app Procreate today updated its Procreate Pocket iPhone app to version 2.0, which developer Savage describes as "reengineered from the ground up" and "an entirely new app." Procreate Pocket 2 is powered by Silica-M, the same graphics engine that powers Procreate for iPad, as well as Apple's own Metal technology. Savage says that with the upgraded technology boost in version 2.0, Procreate Pocket can now create canvases with rich P3 color depth, and users can choose from 136 hand-made brushes that include pencils, inks, wet painting, and digital-only abstract effects. Procreate Pocket also now includes "almost every Procreate feature from iPad," like ColorDrop, QuickLine, Perspective Guides, Layer Masks, custom brush creation, and more. The developer specifically optimized Procreate Pocket 2 for iPhone X users, with features that take advantage of 3D Touch and haptic feedback. "We literally threw the Procreate Pocket 1.0 codebase away and started fresh. Every pixel and every line of code is new, and we're so happy to finally bring Silica-M to our iPhone users," said James Cuda, CEO and co-founder of Savage. The app is also gaining two new features not yet available on iPad, including Brush Set export and import, allowing artists to easily share their creations through online marketplaces or expand their own libraries with thousands of custom brushes from other users. The second addition is a 30 second time-lapse export, which uses a custom built algorithm to remove non-essential frames from any time-lapse and offers a shortened version that can easily be shared on social media. Procreate Pocket 2 is available today on the iOS App Store as a free update for existing users, and those who haven't downloaded the app yet can do so for $4.99 [Direct Link]. I can't see how I would want to do any drawing on an iPhone with no Pencil support. Good job you can use one of the many other stylus available. Or just learn to draw with your finger. It’s not that hard. There's a reason traditional artists tend to use the traditional equipment they do, as opposed to just dipping their fingers in paint and dragging their fingers all over a canvas... That's because finger-painting offers a LOT less control over what you can do. I agree with the OP: if you are going to do painting on an iPhone, then it would be infinitely more preferable to do so with an Apple Pencil than with just your finger. I mean, the app looks brilliant. But I can't see how I would want to do any drawing on an iPhone with no Pencil support. It’d be awesome if they knew something we didn’t!